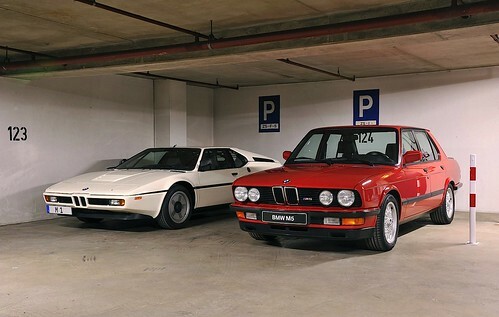 And we’ll say it again— the E28 M5 is not a big car! So imagine how small the M1 must be in the metal. We find ourselves very tempted by the E28 M5 these days, by the way. What’s not to like? Well, hideous diving board bumpers and Natur interior (neither of which is seen here), for starters. Both US-spec, naturally. ~ by velofinds on June 21, 2011. I’m right there with you. Wondering if it’s worth it to go straight E28 M5 or 535is first. i wouldn’t mind an m535i, either. 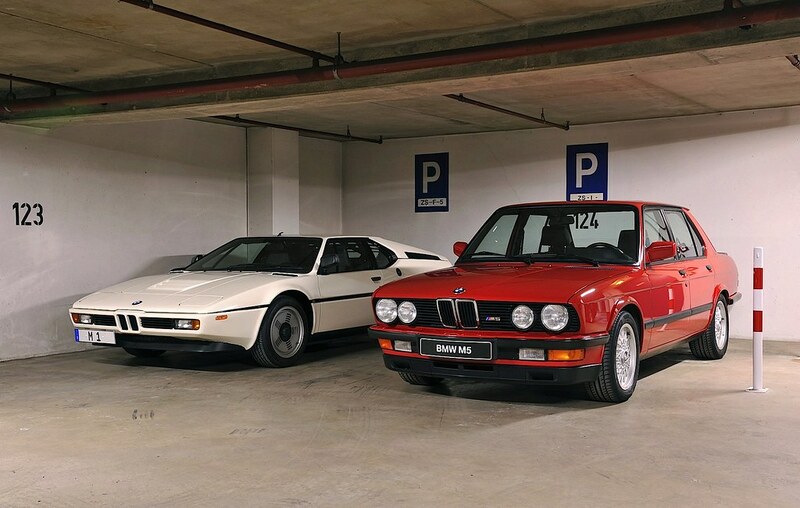 Having seen both M1’s and E28 M5’s in person, neither is particularly large by current standards. However, the M1 doesn’t look as small in person. Low, yes, but not small. By the way, a Euro-spec E28 M5 in red over black is pretty much my dream car. Well-preserved examples are getting pricey though, and in a year or two when we can import 25-year-old examples easily, the cost (+ shipping) will likely be prohibitive. Well,said it before and will say it again. I like the US-style bumpers from the E28 M5 way more than the european ones…..
Maybe because mostly the european M5’s still have chrome accents on the bumpers (and windowtrim), which are IMHO not suited for a sports-saloon. The later ones came more and more in Shadow-line, like the red one in the picture. oh, that’s a very good point, which i hadn’t realized— that the early euro e28 m5 bumpers had chrome accents. i agree that that’s no good. I talked my then girlfriend into buying a e28 M5 about 10 years ago. They are a blast to drive. 2nd and 3rd gears are way too much fun. Unfortunately, she hasn’t taken very good care of it cosmetically since we parted ways. Interior has been thrashed and it needs paint – not to mention it never gets driven more than a few miles at a time and not frequently enough. I have always felt guilty and somewhat responsible for its plight. I have even told myself when she goes to sell it I will buy it and make things right. Then I think of all the other cars on my someday list and come back to my senses.